I'm back! I know you all missed me and I wanted to say THANK YOU for all the well wishes. I certainly NEVER want to deal with one of those cyst things again that is for sure, talk about pain- yuck! The FLAWLESS Margaret Russell herself! Elle Decor had a wonderful event at the Boston Design Center for their Seminar Series and Margaret was the speaker. She spoke about the book Style and Substance and went over some of her favorite photos and stories while putting the book together. The highlight of the day was meeting her in person and having her sign my books. Of course I introduced myself as the blogger who wrote about the little magazine delivery snafu and she knew exactly what I was talking about- LOVE HER! It was an amazing day shared with Carlee, Stephanie AND Emily and it was a blast! Thanks again ladies for such a fun afternoon! 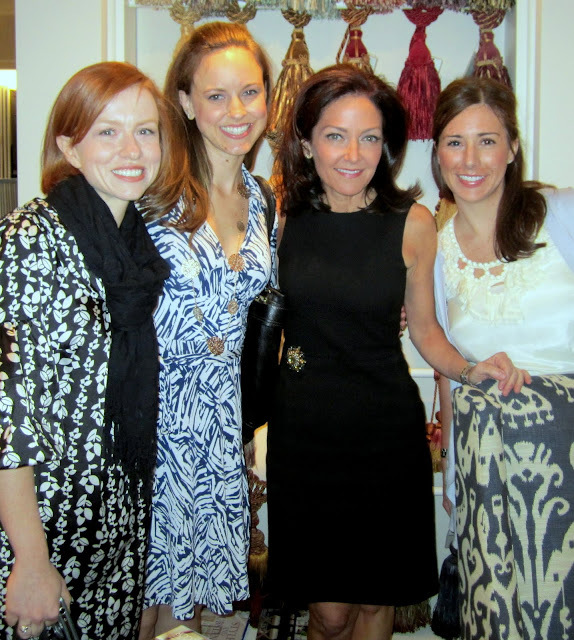 I hope Margaret and Elle Decor return to Boston soon- it was a fantastic event! oooh you all look beautiful, sounds like an interesting afternoon!! Looks like you had a wonderful time. I love your top! So nice meeting all you lovely ladies yesterday! And yes, flawless is the word for La Russell! And, it's so nice to have you back! Aren't you a lucky girl, too funny you mentioned the magazine delivery issue...and that she knew what you were talking about. I just had to take a second look at the top photo, I was looking at your skirt and was puzzled why Margaret had her hand on the front of your waist, and how your skirt was a bold choice...then I realized it is a chair which you are directly behind! I found this extremely amusing...do you see it?! awe you guysssss - you all look fantastic and happy and fun! .. so happy! she looks flawless and I look pregnant. And I'm not. Janell- I noticed that when I first saw the photo, too funny. A skirt in that print would be fun though, I love the fabric! You all look like you had a fabulous time!! very glad to have you back! and can i just say (after reading your blog since the beginning :) it's so nice to be able to put a face to a blogger? you are totally gorgeous chica and look nothing at all like what i pictured! What a fun time. 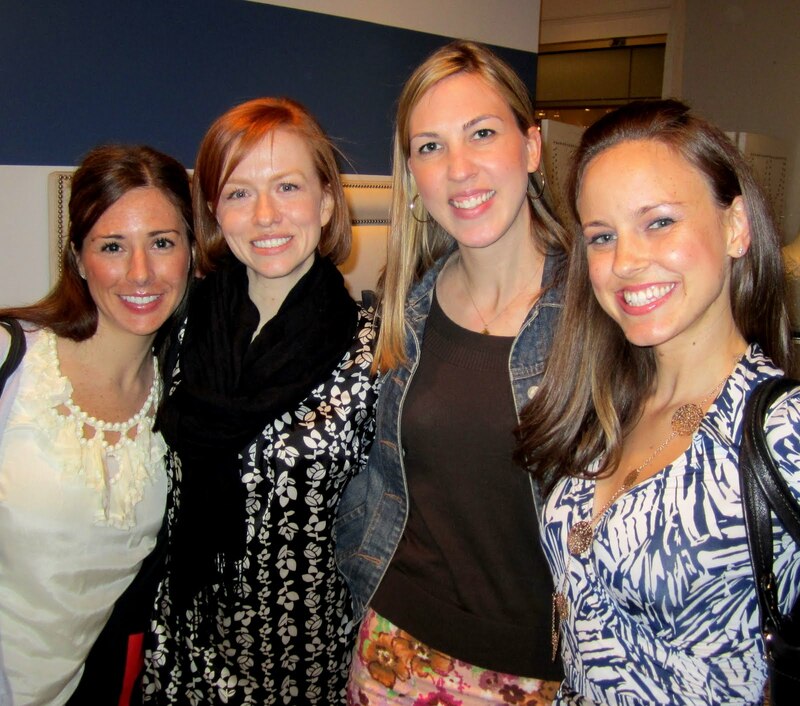 And love the photos and getting to see ya'll! That is so awesome! I didn't know about the lecture series at the design center -- are they open to the public? BTW I put that chevron rug below in the rendering for my project in nyc. I'll send you your check. What a wonderful event! Love Margaret. Her monthly editor's note is a favorite of mine. Sheesh...she really does look flawless! So glad to hear you are feeling better, you look great, adore your blouse. Looks like all of you had the best time! Wow, so glad you were able to attend especially given your current health snafu! Love your top and what fun to connect with such delightful ladies. Cheers to style and substance! Saw this on Stephanie's blog a little bit ago. Soooooooo cool! All of you are so beautiful and fun! what fun! glad you're back in action! I enjoyed meeting you all yesterday (even if it was briefly). Let me know when you are attending any other local design events and I will keep my eyes open for you and your very stylish friends! Lucky you!!! Looks like fun. So glad you are better too. I am so mad I missed out on that photo with MR. Oh well, next time. Had a wonderful time with you ladies!! And so glad you're back and feeling better! First of all, I'm so glad you recovered from your cyst. I've been so busy that I haven't been able to read my fave blogs. I had no idea you were sick. Secondly, I'm so jealous of the Elle Decor event you got to attend! It looks fabulous from the pictures. Meeting Margaret Russell must have been amazing. I'm so glad you were able to get well before this event. so fun!!! you look so beautiful!!! Bummed I missed that lunch - sounds awesome! Sorry about your cyst - I had that happen to me 7 years ago and it was the most painful thing ever. Plus I was newly pregnant at the time and lost the baby. I've never had it again, and hope you don't either! whoa linds. sorry you have been under the weather. i had a similar issue that require surgery. they even questioned my ability to have children after the fact. well, that was 6 years ago and 3 kids later!! you all look absolutely gorgeous in your pics! i hope Margaret makes her way down south someday. hope you understood my comment...i was typing to doggone fast! Welcome back! Looks like a wonderful event - so jealous of you to have met her! I don't know how I missed this, but just saw the pics over on Carlee's blog and had to stop by yours. I never knew what you looked like, but you are beautiful :) And, so lucky! I want to meet Margaret, too!